Varavarisi/ Varupayaru is one of the traditional iyer seer dish in Seemandhan & Valagappu Festival in Tirunelveli. This dish made for my daughter's seemantham as seer. It is made in my village in huge amount exclusively for this function. 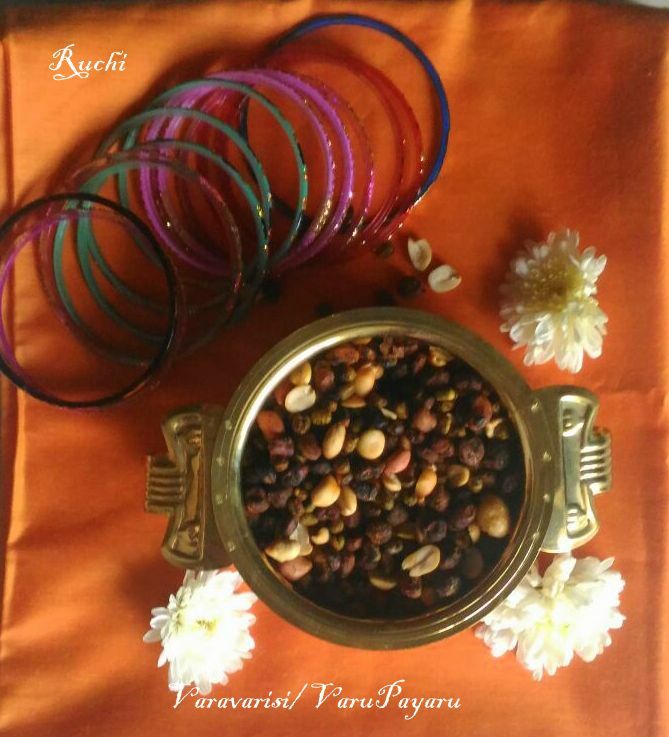 Varu payaru (soaked, dried, roasted pulses) is a combination of two tamil words. “Varuththal” means Dry Roast. “Payaru” is a common name for all Legumes. Legumes are a very healthy food because it is low in fat and high in protein and also very high in fiber and other nutrients and oil free snack. So it gives during the pregnancy. Knead, adding little water to tiny balls & deep fry in oil. 1. Wash and Soak the lentils separately for overnight. Next morning drain off the water and dry the grains separately. 2.Drain well and tie in damp cheese cloth separately. Allow them to sprout. Rinse once or twice during the sprouting period. 3.When the legumes sprout, spread them in a dry cloth/towel and keep them in a warm place. The legumes will air dry. 4.Take the salt, turmeric powder, red chilli powder and asafetida in a small cup and moisten it with 1/2 teaspoon of water. 5.After the legumes are ready slowly roast each of the dried pulses separately one after the other in a heavy bottomed pan, till they turn light brown in color. 6.When they are nearly roasted, add a spoonful of the masala mixture to each of the pulses, and roast till all the water is absorbed. 8.The Varavarisi is now ready for Seer. This is very healthy snack too..